Dingo in the Dark is a soothing, atmospheric tale about a Dingo who longs to play with his friends. Unfortunately, he is too tired during the day to enjoy their company! In fact, poor Dingo is awake all night, too afraid to close his eyes amidst the darkness of nighttime. Sound familiar? I have a three-year-old who is currently in the throes of the nightlight needing, monster-fearing, dark-abhorring stage. If I'm honest, I suppose to an extent I never entirely grew out of it either. 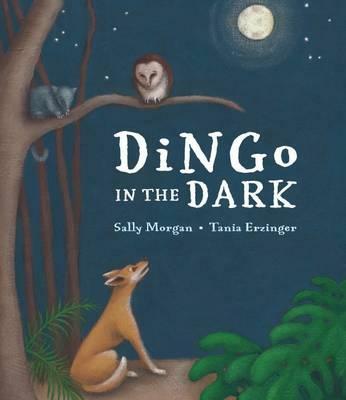 That's where a book like Dingo in the Dark comes in. The beauty of this story is that it's a subtle and gentle nudge in the direction towards the moon. That is to say, the story urges young readers to find some comfort in the nighttime. This is not the sort of tale I usually read to my son, as I tend to gravitate towards louder and sillier books. I made an exception in this case, considering how relevant it is. To my surprise, my son was intrigued! He listened quietly to the story, digesting the message. I was most pleased and relieved, and I will definitely be reading the story to him again. Morgan's words are soothing and simple, yet pointed and powerful, and the illustrations... oh, the illustrations! I absolutely adore the soft, glowy night that Erzinger has masterfully created. I'm going to take linguistic liberties here and say that the pictures sing from the page! There is somehow as much sound in the images as there is in the words, and that, my dear reader, is worth its weight in ink!